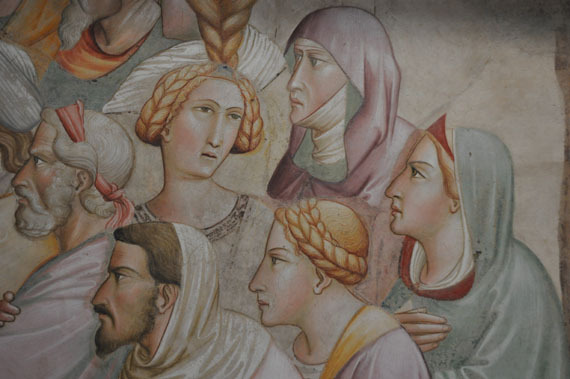 When Agnolo Gaddi and his workshop painted the high chapel at the Church of Santa Croce in Florence with scenes from the Legend of the True Cross, he included all sorts of details – an ear through a transparent veil, a squirrel up a tree, a black rooster and some sawdust – that would never be seen from 35 meters below in the transept. Why? Our guide, Marco Palumbo, explained during the scaffolding tour that is open to the public until they take the structure down, predicted to be around mid 2013. 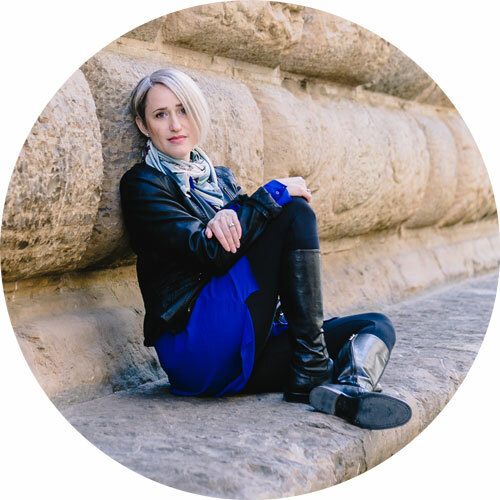 And I got exclusive permission to photograph the experience and share it with you! 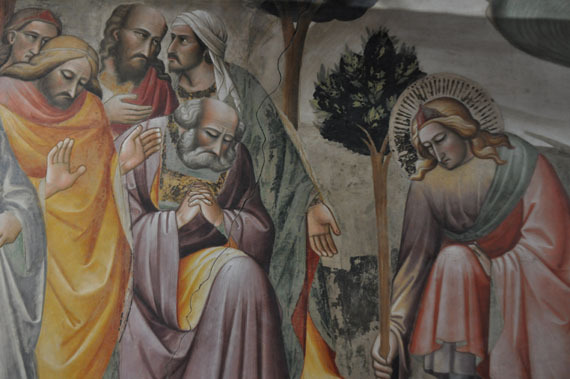 Agnolo Gaddi, the official heir to the school of Giotto (son of Taddeo Gaddi, who was Giotto’s godson), received the commission to paint the high chapel at Santa Croce around 1380 from the Alberti family. 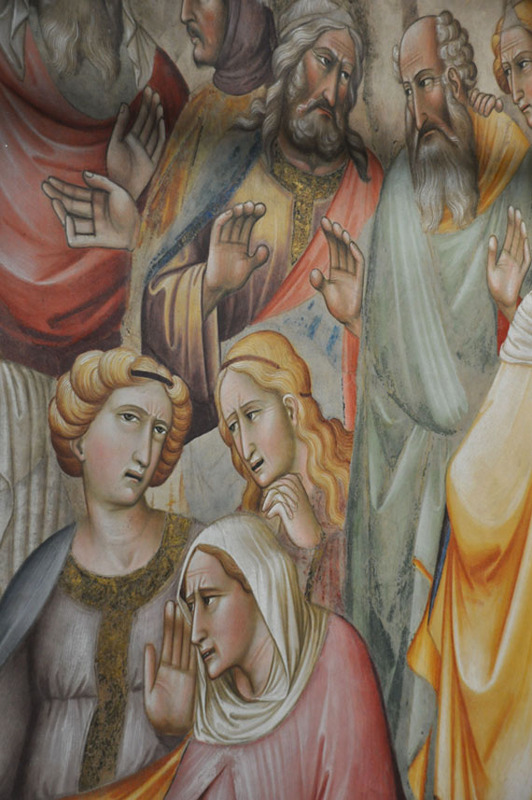 Although the chapel is the largest and arguably the most important in the church, it was the last to be painted – around it were 5 chapels painted by Giotto and his school. Why it was done last remains a mystery. 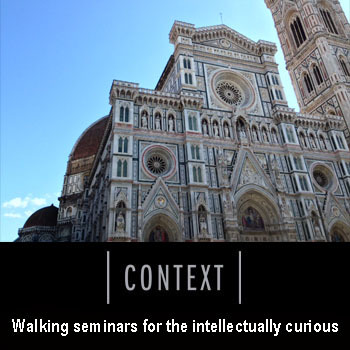 The topic is the Legend of the True Cross, as told in the Golden Legend by Jacopo da Veragine. It is told in eight scenes, reading from top to bottom, first on the right side (looking at the altar), then on the left. 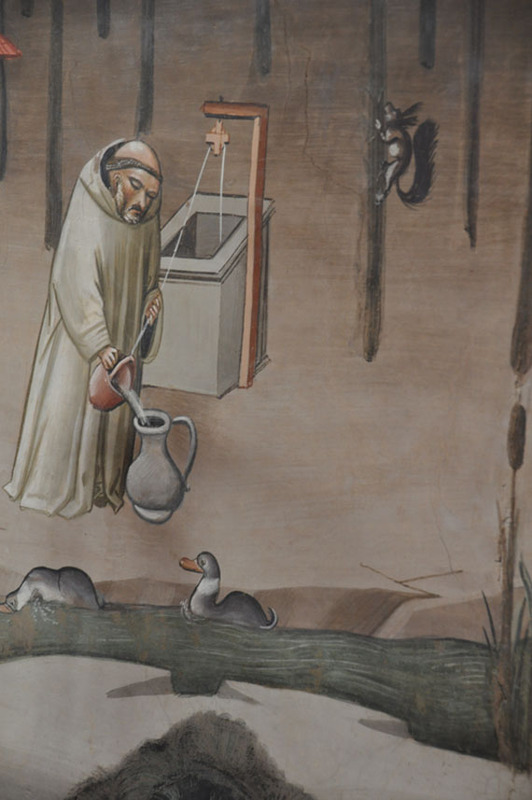 The artist followed the text closely, guided likely by the Franciscans, while also working to satisfy the Alberti patrons and, as much as possible, to satisfy his own interests in running a large workshop. 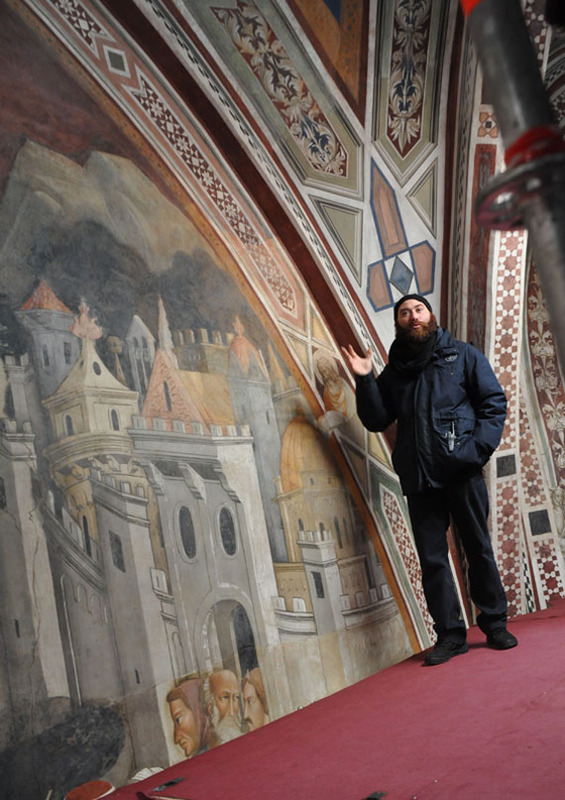 That the huge fresco was used as grounds for teaching may begin to explain the inclusion of numerous features that otherwise would appear to be “art for art’s sake” – the details mentioned above, that could not be seen from the ground. In 2005, scaffolding was erected in the high chapel, so view from the ground has been blocked for almost seven years, but since Easter 2011 and until approximately June 2013, the structure has remained installed while restorers complete final work on the wooden crucifix above the altar and on scenes on the exterior of the chapel. 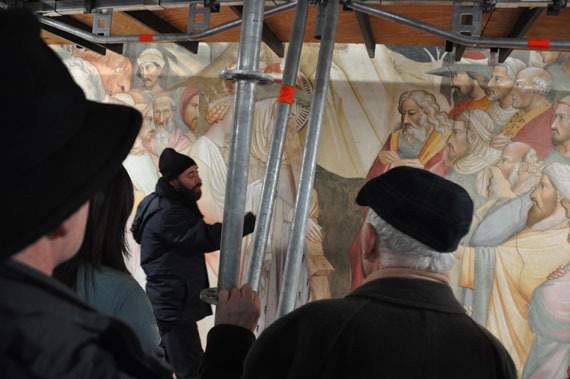 The restoration of the frescoes inside the chapel is complete, thanks to funding by a Japanese patron of the arts, Tetsuya Kuroda, who donated 1.2 million euro; the rest has been financed by the Opera di Santa Croce and a small amount by the state (MiBAC provided 285,000 euro). 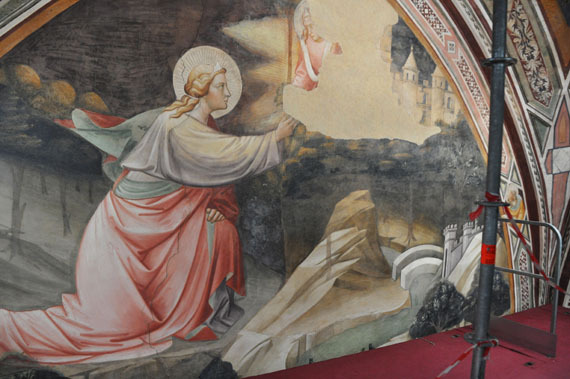 The restoration involved consolidation of the frescoed surface, including removal of dangerous inserts of gesso and metal that had been used in the past to fill cracks that naturally occur with ground shifting; cleaning of the entire surface from centuries of dirt, using water and some neutral chemicals; and conservative neutral infilling of large lacunae in the iconography. 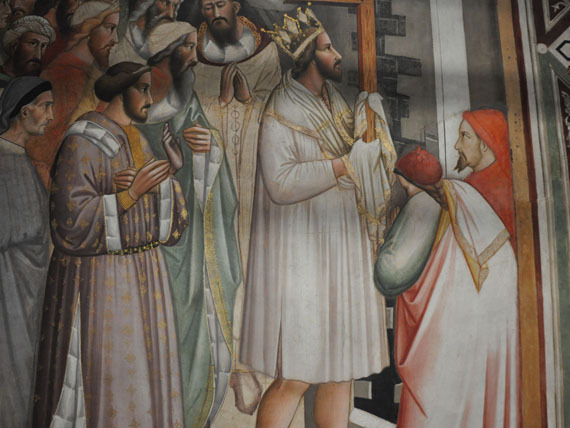 When Gaddi and his workshop set out to paint this massive chapel, of course they first planned the iconography (along with the patrons) and decided what was going to be painted where. Cartoons were drawn (and probably approved). And perhaps at the same time, he thought about how he would reach the walls, and planned the design accordingly. 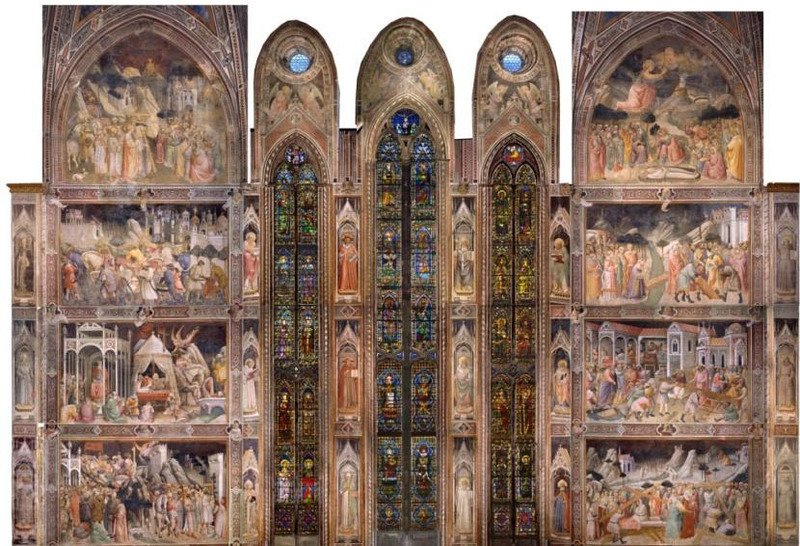 Each scene, which is delimited by decorative borders, is divided into an upper and lower part, usually consistent with landscape or architecture in the upper/background and figures in the lower/ foreground, with the top right lunette as the only real exception. Gaddi set up his scaffolding at the division between these areas. The modern restorers did the same, when possible using the same anchor holes made over 600 years earlier. In the photo above, you can see one such dividing line near Marco’s feet; below is another example, shot downwards where the scaffolding floor has been lifted – the upper scene is of a hospital, and the lower scene shows the Cross being sawed to pieces. 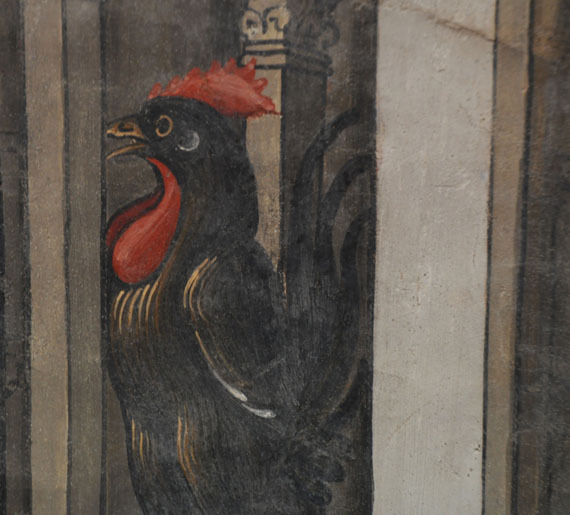 Of the other things that can be seen from up close, three involve what is now (mostly) lost: blue pigment, wax relief, and gold and brass applications. 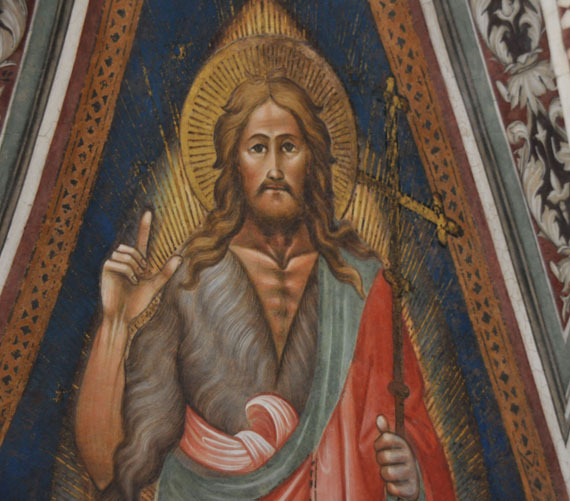 As you may know, blue pigment and fresco don’t get along, so ultramarine or less expensive blue pigments were applied “a secco” – dry, at the end of the process. Where blue was to be applied, they put a dark red base so help set off the colour (it was more effective, ie. cheaper, to paint blue over red than on white plaster). 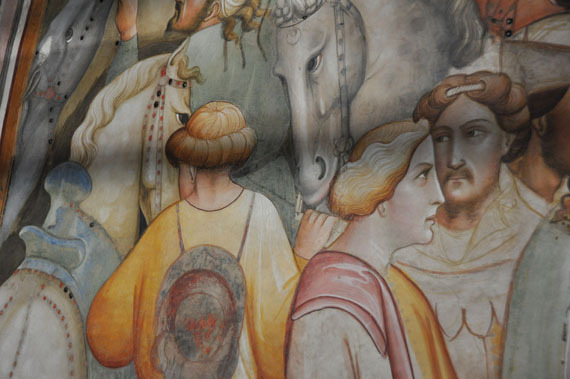 Over time, fresco remains, but a secco does not. The only blue left at all in this chapel is in the vault frescoes depicting the four Evangelists, plus Saints Francis and John the Baptist. In the rays coming off Saint John here, you can see a bit of gold leaf, which was also used in decoration on clothing throughout the frescoes. 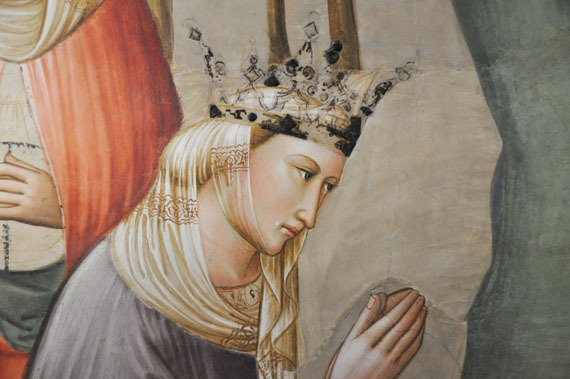 In some cases this is intact or has been helped along by previous restorations, and the presence of gold is altogether to be expected in a commission of this sort. An element that one sees less of, unless one spends a lot of time up on scaffolding I suppose, is wax applications that were subsequently gilded. 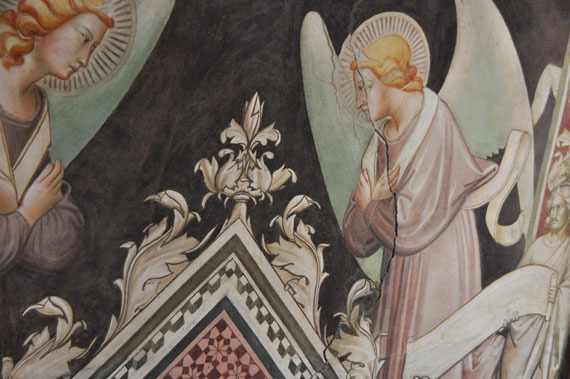 These provided relief and thus were more visible from below – I think later artists built up using gesso rather than wax, as I seem to recall seeing this on a scaffolding tour of the Lippi frescoes in Prato (years ago, pre blog!). 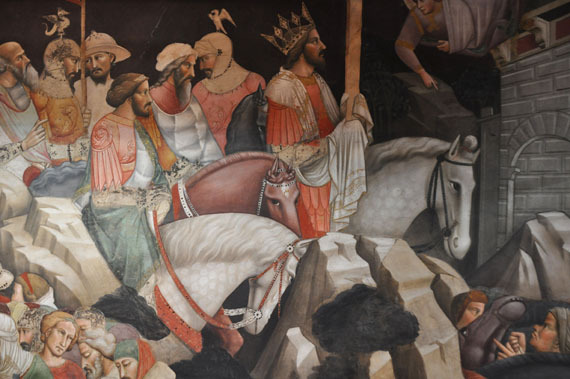 On the left side of scene photographed below, see how the horses’ apparel were decorated using this relief technique. 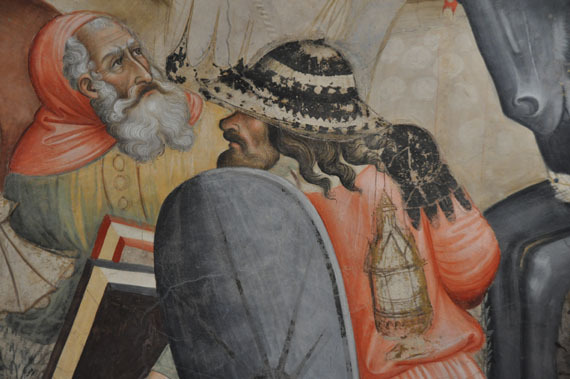 The third lost element in these frescoes is the application of brass “gilding” rather than gold, which was used amply in the battle scene on the left wall, where robbers are stealing all sorts of things (incense holders, reliquaries, etc. ), and all of these things once shone with metallic splendour. Now, we don’t have the bling, but we do have… underdrawings. Where brass is lost, drawings are gained. See the stuff under the robbers’ arms? 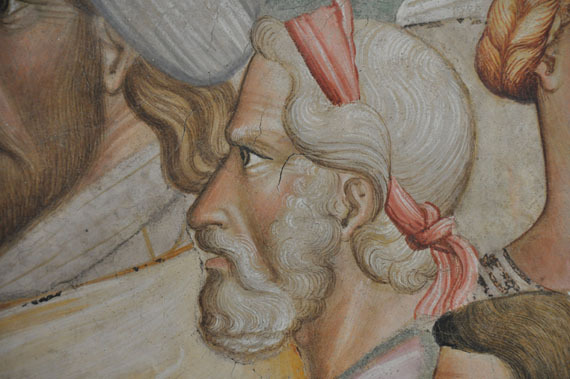 The other great marvels of this fresco cycle are: the delicate technique used, the variety of facial types, and the unusual details that nobody would ever see until they climbed up as we have. 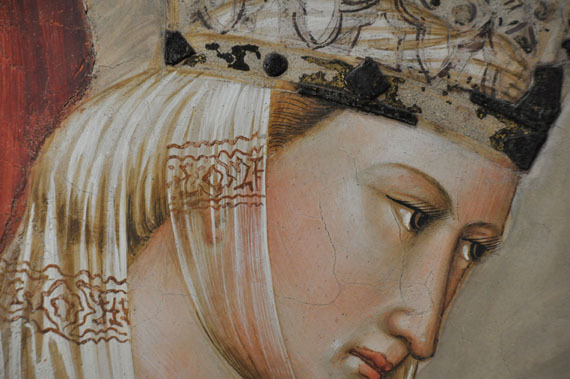 … and the Queen’s ear. 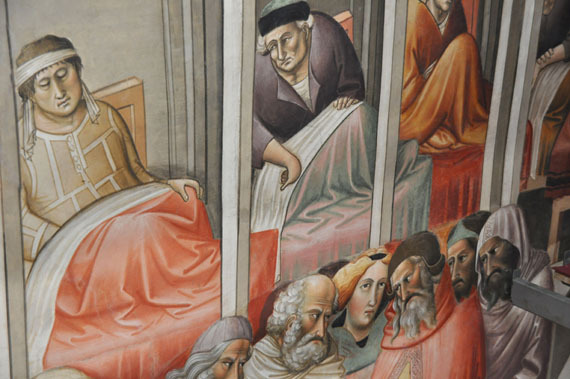 In the case of other details, the Master’s hand may not be present: little things painted far up in the fresco, representing details of the landscape background, were probably added by students. 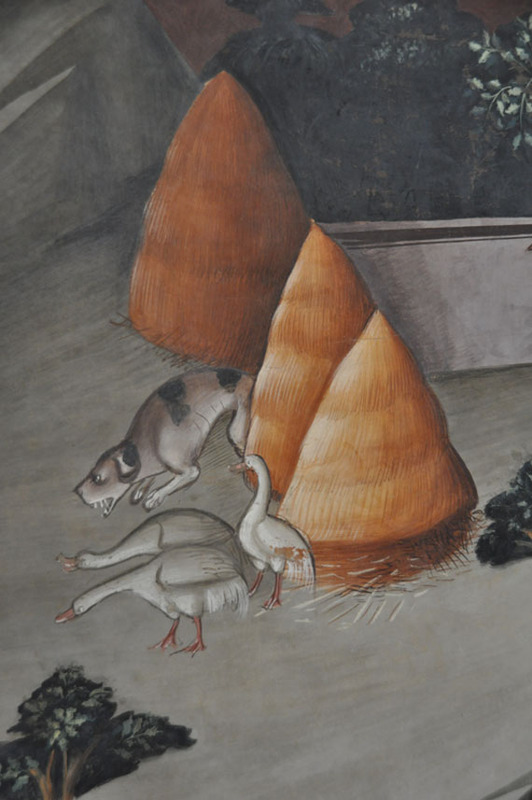 These adorable scenes of animal life indicate that very few people in a 1380’s city had seen a squirrel in real life. The ducks are cute, though one looks somewhat like a mini dromedary. 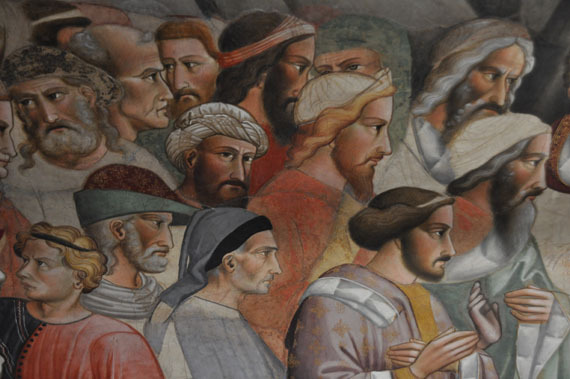 Finally, a quick nod to another feature that is very present, though not so unusual for a fresco of the Giotto school: every face is different. Well, that is, except for a few that were done with the same cartoon. 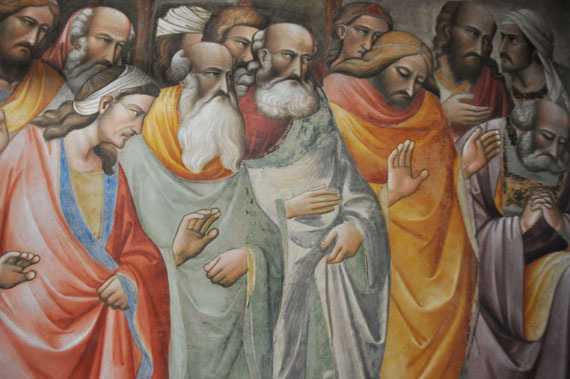 Like Giotto, Agnolo Gaddi characterized every figure with facial shape, intricate hairstyles, clothing, and gesture. 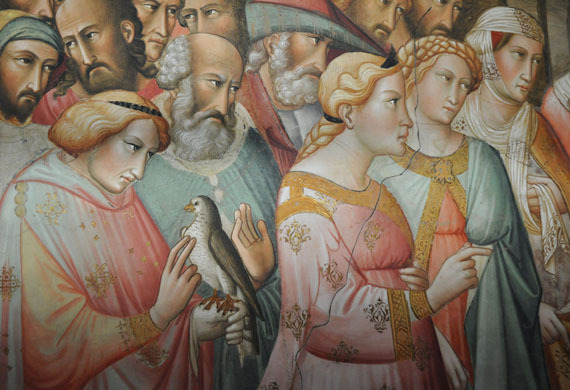 Here are just a few examples of such detailed figures in the “crowd” parts of the fresco. 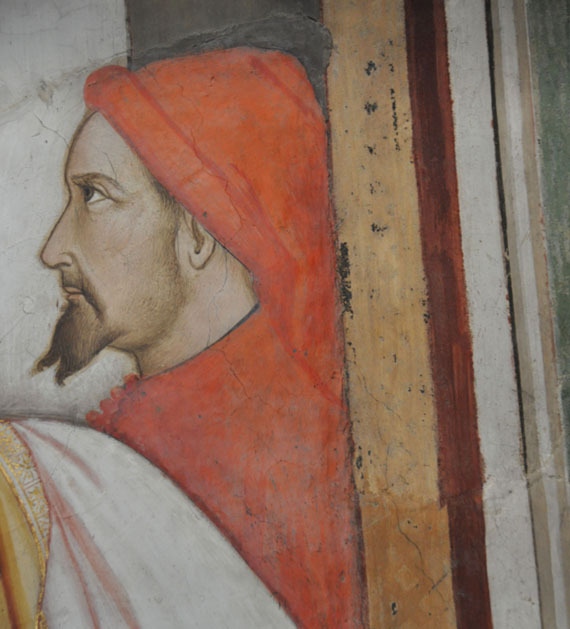 And at the end, Gaddi included his own portrait, something that was to become common in the Renaissance – but does anyone know if, in the 1380s, other artists had done so? 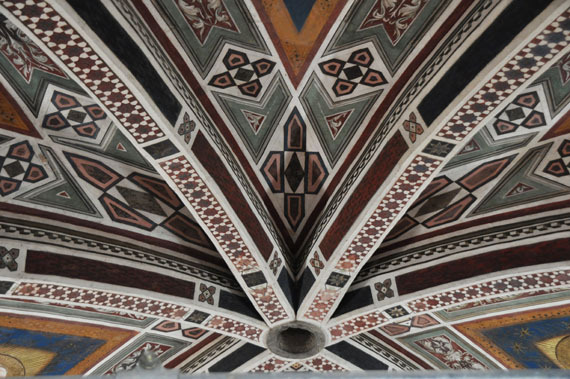 This video by my colleague Brenda Dionisi at The Florentine for LdM news includes an interview with the director of the Opificio delle Pietre Dure, responsible for the restoration, and points out some of the work’s unusual features. 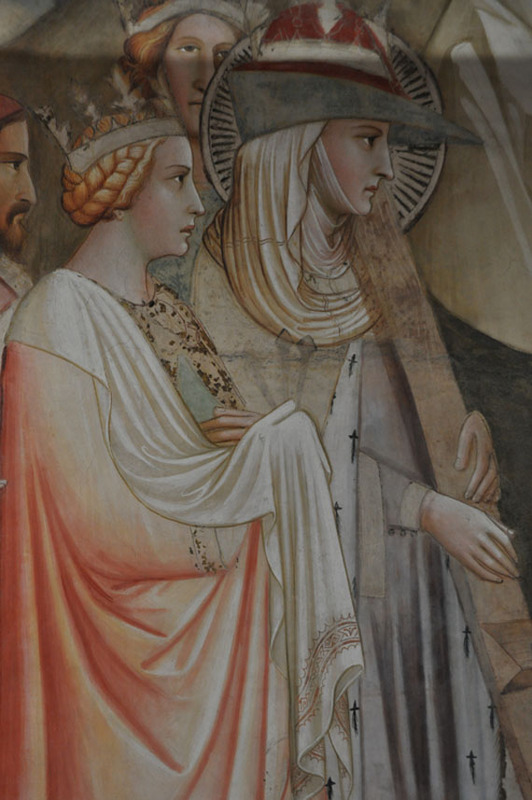 To find out more about the restoration of this work, or to zoom in and study the frescoes if you can’t go in person, you can use the Modus Operandi online interactive documentation system. 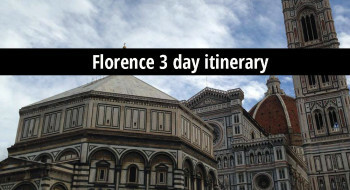 If you’re visiting Florence before June 2013, put this tour on your schedule. 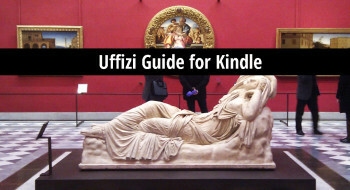 It runs almost daily, is available in English or Italian, and costs only 10 euros per person for a once in a lifetime experience. 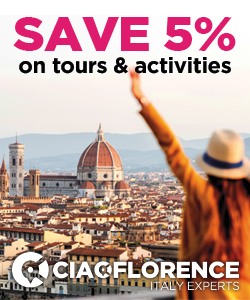 Contact Opera di Santa Croce – the tour costs 10 euros per person and includes access to the entire church. 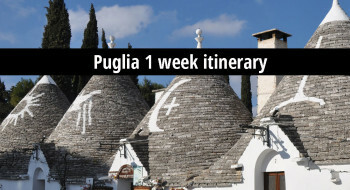 PHOTO RIGHTS: All photos COPYRIGHT arttrav.com 2013, used by permission of Opera di Santa Croce. Photos may not be reproduced. 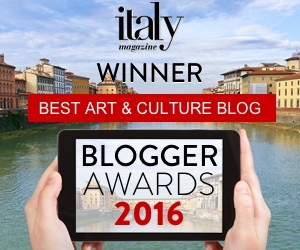 If you wish to obtain copies of any of these photos for educational use, only for classroom projection, please write to info @ arttrav.com.